“29 thousand tweets already today on #CarlsenAnand. Hats off to chess lovers around the globe”. I think it is slightly unclear if he meant that on that particular day 29.000 tweets were written, or 29.000 tweets with the hashtag #CarlsenAnand in total during the whole match (until 20 November). Dr. Gaurav Garg Insan aka @gauravinsan did not answer my question which hashttag tracker he used. 29.000 Tweets per day? Never! I did not believe it. This claim sounds like the 600 Million fairy tale AGON wants us to believe! If you want to read more about this subject, go to the Streathan and Brixton Chess Blog. Recommended! You can see that I started tracking the official world championship hashtag #CarlsenAnand on Nov. 20, after I read the tweet by @gauravinsan. The first hick-up is on November 21, when the 10th game was played. A lot of tweets were written on Nov. 23, when the 11th and last game was played. Rather interesting is the number of original tweets and the number of retweets: 8.839 tweets, 14.552 retweets, which is almost 60% of the total number of tweets! Does that make chessplayers lazy tweeters? Most tweets: A surprise: number one is not @TarjeiJS, the Twitter Guru from Norway. The most tweets came from the official twitter account @AnandCarlsen14. Number two is @riksec08, but he only retweeted, and did not manage to write one single original tweet! I have no idea why somebody retweets thousand of tweets, especially when you only have 68 follower. Lost on me. Platform: which device do tweeters use? Not everybody used the hashtag #CarlsenAnand. Other popular hashttags used were #chess, #carlsenanand2014, #nrksjakk (for the Norwegians), #wish4vishy and #c24live. Is it safe to say that somewhere between 60.000 and 70.000 messages were tweeted and retweeted during the chess world championship 2014? Quite a lot, right? It would be interesting to compare the number of tweets to similar events, like as snooker world championship or a darts world championship final. Of course, it is not fair to compare the chess match to the Superbowl (American Football), but just to give you an idea: in 2014 24,9 Million tweets were sent during the game Seahawks vs Broncos! Finally, a quick look at this site: around 750 to 1000 people visited this blog every day during the match. Most visitors (top 5) to this blog came from India, then USA, Germany, Norway and The Netherlands. Top 5 cities: Bangalore, then Chennai and Mumbai. Oslo came in 4th place, London on 5, Sochi on 12! Did Carlsen and Anand read Chess in Tweets? Of course they did! How to continue Chess in Tweets? Would you like to see a weekly episode with the best tweets of the chess week? Do you prefer an event blog, like I did this year during the Candidates, Olympiad and World Championship? Other suggestions? If you have an idea, let me know! Thanks. One more tweet about the Berlin defence: @nigelshortchess: “When I become FIDE President, the first thing I will do is ban the Berlin”. @harrypillsbury: “When I become FIDE chess president, I will reinstate the zonal system and the 24 game WCM every 3 years“. @bennedik: “Game 10 prediction: Anand castles long against the Queen’s gambit line from game 8”. Wrong guess! @vishalsareen: “This is it.. Grunfeld Qb3.This is the game we all wanted! Let’s see who is better prepared! This will be strictly homework”. @fabianocaruana: “The gloves are off”. @rajachess: “Well… Close to equality. But press by white!” @chessidharta: “Vishy pressing again . Magnus seems to have problems against 1.d4”. @sethuramanchess:“After 19 Ng5,The look says it all .I am coming for you”. To be honest…the most exciting moment in the game was when Magnus played the very unexpected move 19… Bxg2. Twitter went wild! 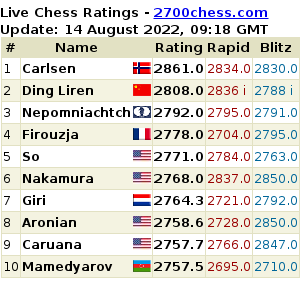 @FabianoCaruana:“I think someone just wanted to give a few million people a collective heart attack”. @pogonina: “Carlsen played Bg2, smiled, took out a Men in Black stick, partially erased our memories and went for Bd4 instead”. @TerEndle: “Well, a decent enough try from Vishy, but just not enough. It’s a better match than last year, but it’s slipping away from him”. One last tweet for today: @vinodharidas:“Ugh. I feel like smashing a chess board”.